Welcome to Sotograndeonline.com and we look forward to assisting you in your move to Sotogrande! Safely buying the ideal Sotogrande property for your family is a matter of working with a very well known, respected and long-time property agent in Sotogrande like Consuelo Silva. Having a strong and friendly relationship with Sotgrande property owners (who in the past were property buyers in Sotogrande) and with an extensive knowledge of all Sotongrade areas and insights, Consuelo Silva, for sure, will lead you to the best villas, apartments and property developments in Sotogrande. Looking for luxury and high-end properties in Sotogrande area? Get in contact and let us show you our private portfolio of luxury villas and apartments for sale in Sotogrande. "We offer a valuable service to persons planning to buy or sell a property"
Apartment in La Reserva, Sotogrande Village Verde Sotogrande. A community like no other. 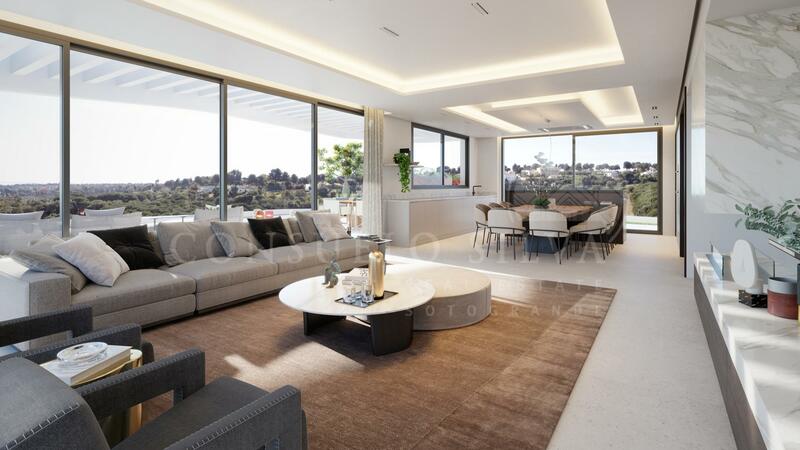 Magnificent penthouse with views to the main canal of the Marina and Gibraltar at a distance. Spectacular property Front line golf ALMENARA! SOTOGRANDE. Village Verde Sotogrande. A community like no other.